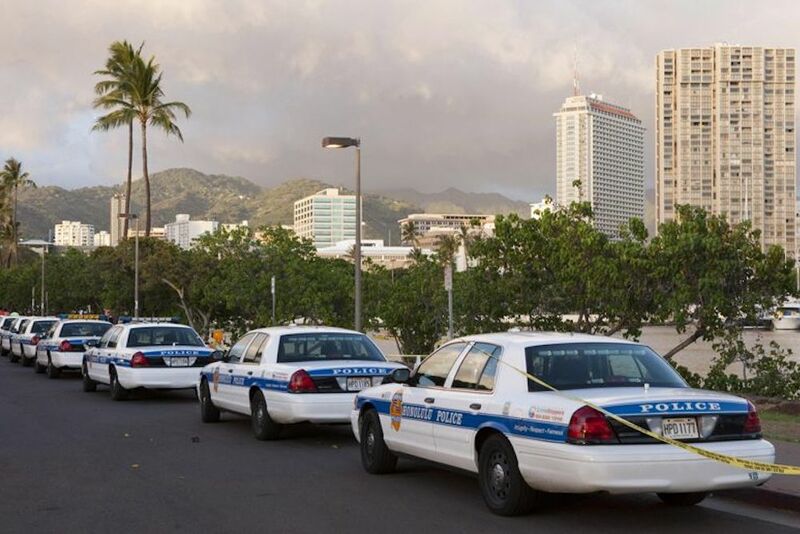 Police cars in Honolulu, Hawai‘i. Courtesy of The Grassroot Institute of Hawaii. Although it’s best known for tropical weather and natural beauty, the Aloha State has another quality that distinguishes it from other states: the lowest rates of gun violence in America. In 2015, Hawai‘i had a mere 2.6 gun deaths per 100,000 residents, compared to 11.8 nationally and an astonishing rate of 19.2 in Alaska. Even Hawai‘i’s urban areas are relatively free of gun violence. Honolulu, the capital of Hawai‘i, has the lowest violent crime rate of any city in America. Its homicide rate is similar to the Dallas suburb of Plano, Texas, which is among the country’s most affluent communities. What is Hawai‘i doing right—and can it be a model for the nation? The islands’ low unemployment and a local culture that takes living with aloha seriously certainly contribute to the state’s low rates of gun crime. But Hawai‘i is far from being a crime-free paradise. Property crime is relatively high in Honolulu, and the city has about the same number of car thefts per capita as Los Angeles. In other words, there is crime in Hawai‘i, just not much gun-related crime. And this suggests that Hawai‘i’s strict gun laws—rather than its prosperity or unique local culture—are responsible. Hawai‘i is the only state that requires all firearms to be registered—both rifles and handguns. All police departments are required to run background checks on anyone trying to purchase a gun. The law does not limit the number of guns that may be purchased at one time, but it does require all purchasers of firearms to register for a license. Buyers with a history of mental illness, drug or domestic violence convictions, certain sexual offenders, and anyone with a restraining order are disqualified. Put this all together, and Hawai‘i is the state with the seventh-strongest gun laws, according to grades from The Brady Campaign to Prevent Gun Violence. In 2017 Guns & Ammo magazine ranked it as the 47th-worst state for gun owners, in part because it has a de facto ban on concealed carry weapons permits. The result of these regulations is that, by most measures, Hawai‘i has one of the lowest gun ownership rates in the nation. One recent study estimates that about one-quarter of households own guns, compared to a national average of 57 percent and a high of nearly 77 percent in Mississippi. And America has lots of guns—nearly one for every man, woman, and child. Mass shootings receive the most media attention, but every year thousands of people fall victim to gun-related violence. According to the Human Development Index, the United States has nearly 30 gun homicides per million people, compared to 5.1 in Canada and just 1.4 in Australia. More guns are associated with higher suicide rates and violence against police, too. Simply having a gun in the house increases the risk that a family member will take his or her own life. Hawai‘i’s low rates of gun ownership almost certainly contribute to the fact that it has the third-lowest suicide rate for men. The islands’ low unemployment and a local culture that takes living with aloha seriously certainly contribute to the state’s low rates of gun crime. But Hawai‘i is far from being a crime-free paradise. Hawai‘i’s experience isn’t the only evidence that comprehensive gun laws make a difference. One major article in Epidemiologic Reviews reviewed 130 studies from 10 different countries and determined that restrictive laws were associated with fewer gun-related homicides and suicides. But looking to other nations for our inspiration is not always a useful exercise. America has a long tradition of gun ownership, and the Second Amendment makes it impossible to enact regulations like those in Japan or the United Kingdom. Which is why Americans might think more about Hawai‘i. Over the past decade, as other states have made it easier to purchase or carry firearms, Hawai‘i has doubled down on its restrictions. Recent laws prohibit the possession of so-called “bump fire stocks” and require people with significant behavioral or mental disorders to surrender their firearms and ammunition to police. Hawai‘i was also the first state to cooperate with the FBI’s new “Rap Back” system that will notify local police whenever a gun owner has registered anywhere in the United States. Hawai‘i’s relative isolation suggests just how well strict regulations can work. In many cities and states, it is easy to subvert the law by driving across state lines. This can make it difficult to gauge the effectiveness of gun laws. But Hawai‘i’s unique geography make this impossible: All guns must be transported on a plane or arrive in a regulated cargo shipment. Hawai‘i’s experience suggests that common sense gun regulations, when they cannot easily be subverted, save lives. These laws work even in a place that struggles with other, less serious forms of crime. It is time for Congress to pass national laws that follow Hawai‘i’s lead. Colin Moore is an associate professor of political science and director of the Public Policy Center at the University of Hawai‘i.